Entries will be accepted through Friday, December 4. Winners will be chosen through a random drawing from all entries and announced the following week. We hope you’ll enjoy this blog post and video interview featuring Ruth McHaney Danner. How many quilts does your family need? If you’d asked Laura Ingalls Wilder back in the 1890s, she would’ve counted on her fingers: “Let’s see. Two or three for each bed, one for Mary’s rocking chair, and a few extras for replacements.” She’d admit the need for ten to fifteen quilts. Today, if the question came to you, would you count on your fingers? Is your house cold enough in winter to require three quilts on each bed? Do your quilts wear out from daily use? More likely, you’d confess that your quilts serve as decorations rather than necessity. But we continue making quilts, even though we have no real need of them. Why? Because we love the hobby. We like the thrill of shopping for fabric, the joy of choosing a pattern, the pleasure of cutting and piecing. We also enjoy layering and quilting, then binding the edges. And, oh, the ecstasy of spreading out our new creation on the bed for the first time! Absolutely nothing wrong with any of that. But what eventually happens to this quilt? We enter it in a competition or quilt show, take photos and share them on social media, then fold the quilt and stack it in a closet with the others, all doomed to an idle, unfulfilled future. When we notice a slight bulge to the closet door, we pull out the quilts and refold and rearrange them for a better fit. Occasionally, we lay a quilt across the sofa or spread it on the guest bed as a seasonal accent. We might add a sleeve to the backing and hang the quilt on a wall for a month or two. Then what? Back to the closet. Why not change the paradigm? What if, instead of making more quilts for the closet, we made quilts for others? We can still experience the pleasure of shopping, cutting, piecing, quilting, and binding. We can still enter competitions, take photos, and show them off. But after all that, we can donate the quilt to a cause we support. First, the people I call “ordinary” make serviceable bedcovers for homeless shelters, halfway houses, and grass huts. These quilters don’t consider themselves skilled professionals; they simply enjoy contributing to society. Their quilts are pieced quickly with donated fabric and uncomplicated patterns. When finished, the quilts travel across town or across the globe, filling practical needs. I call a second category of quilters the “occasionals.” These skilled persons might try a new color combination or a different setting for their blocks, or they might choose a particular charity, such as Quilts of Valor (www.qovf.org), and make carefully planned bedcovers. In this group I’ve found some whose skills far surpass the norm. These few remarkable quilters create stunning masterpieces, which hang in museum displays, hospital entryways, and art galleries across the country. In some cases, the quilters have earned considerable income from their work. Or their quilts have been auctioned, with proceeds donated to charities to fund scholarships, medical centers, and water-purification systems, for example. Perhaps a third category can be called “others.” Some are quilters; some aren’t. I think of Diane Rose (www.theamazingquilter.com), whose eyesight faded to black while she was a young adult. Even so, she quilts for a living. She also gives motivational presentations to churches, schools, nursing homes, and quilt groups, hoping to encourage and inspire those around her. Additionally, I think of Gee’s Bend, Alabama (www.auburn.edu/academic/other/geesbend/explore/catalog/slideshow/), whose quilters transformed their poverty-ridden community into a nationally recognized destination for quilters and outdoor enthusiasts. Neither Diane Rose nor the Gee’s Bend quilters donate much of their work to charities, yet they still touch lives through quilting. And what about the other “others”? They don’t sew, but they may be spouses of quilters, friends of quilters, or champions of charities that need quilters. In all cases, these individuals contribute by donating fabric and supplies, volunteering to drive or haul, or paying to ship quilts to their destinations. If they prefer more hands-on work, they can join a quilting bee and iron, sort, or cut fabric. Or they can use their skills to research and promote quilt-related charities. So, the “ordinaries,” the “occasionals,” and the “others” can all find ways to use their creations, instead of stuffing them into a closet. Whether selling them at auction, sending them overseas, or donating them to a good cause, quilters have multiple reasons to make more quilts — even if they don’t need them. Surely Laura Ingalls Wilder would approve. Ruth McHaney Danner is the author of Making a World of Difference One Quilt at a Time. She has won numerous awards for her quilting and donated countless quilts. She lives — and quilts — in Spokane, WA. Her website is www.RuthDanner.com. 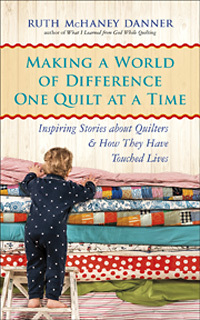 Based on the book Making a World of Difference One Quilt at a Time: Inspiring Stories of Quilters and How They Have Touched Lives. Copyright © 2015 by Ruth McHaney Danner.